I love a flea market. Used book sales. Thrift stores. And most especially, my local reuse center SCRAP. We also have the grand dame of Northern California antique fairs at Alameda Point (first Sunday of the month). Even if I’m making something with new supplies, I often add in a bit of old paper. I feel like it anchors the piece in a wholly different time. I also have crates of old books, vintage notions, and chipped plates all just waiting for divine inspiration. 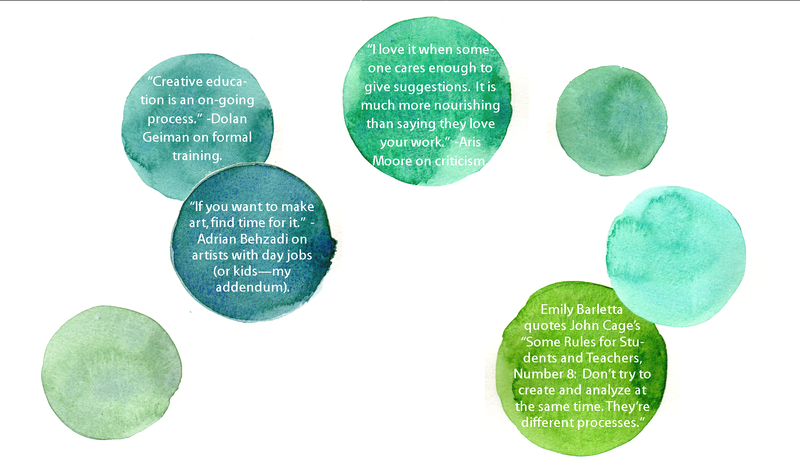 Enter Blair Stocker’s new book, Wise Craft. 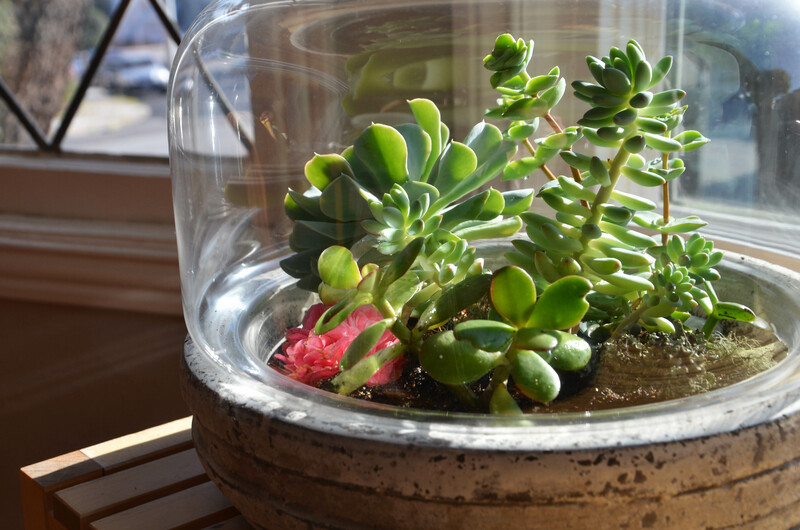 Turning Thrift Store Finds, Fabric Scraps, and Natural Objects into Stuff You Love. 184pp. Running Press, 2014. $20. This soft-bound volume is jam-packed with ideas on resuscitating old things. Its’ cover brings handicraft right into modern: embossed title cut from fabric and scraps, subtitle in a cursive chalk, author’s name on a garment label. 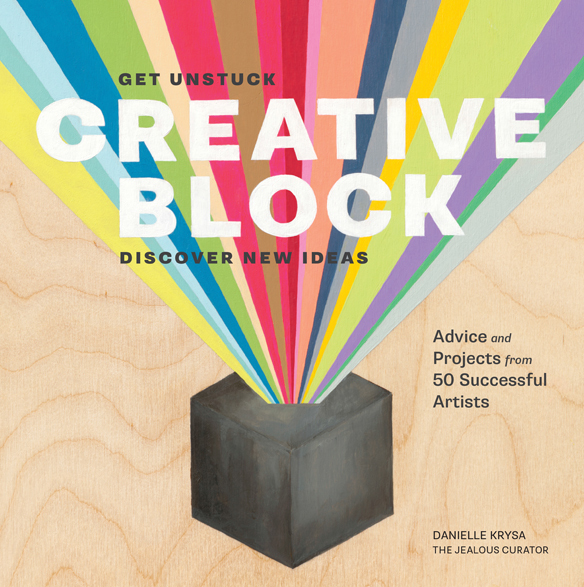 There are several tutorials simply illustrated by Lisa Congdon. The book is well-indexed, and has a host of templates to help you complete the projects as seen. Blair also recommends a crafter’s toolkit. It’s a curated list that many people should have no trouble rounding up. The book is arranged by season, though many projects could overlap. I relish when cookbooks organize by season, and I can see why Blair takes this approach as we all go through seasons of creativity and making distinctly related to weather, light, and materials. Each of the 60 projects begins with a brief, but personal description; I enjoy knowing why and how a person was inspired to make something. Some of Blair’s projects are very simple and easy for the new-to-crafting type. This might be frustrating for the more seasoned DIY-er, but I prefer to see these seeds as starting points: how can I make that silhouette leather coaster more interesting for me (who loves to emboss/stitch leather). The book is appropriate for all level of crafter. Spring for Blair means cleaning and tidying, and the inspiration to make new things. This chapter has home décor items like personalized statement dishes—easily accomplished with the right china marker, and a recycled flower mirror (the mirror frame has been embellished with soft fibers and felts cut into leaves and blossoms) that has me wracking my brain to remember where I tucked away those old sweaters I was saving for something special. She made a series of glittered art wall pieces that features the Stocker Family made-up words. I instantly thought of a short-list of words and phrases that would look great in glitterati for our house. Summer, in the words of Blair, “is the peak season for garage sales.” And when I saw her woven chair back, I was awed. There are so many times when I pass up rattan or caned chairs because I’m slightly intimidated by the brittle material. But this chair boasts a fresh seat and colorful woven backrest. When I recently walked through Salvation Army, I heavily contemplated a gorgeous old chair with an upholstered seat, and a weathered rattan back. I need to go back; I’m committed to trying something similar. Another classic project from the book is the miniature faux taxidermy mounted in deep shadowboxes. I adore shadowboxes. The hard part is editing what goes into them, and this project has inspired me to keep it simple. Blair’s shadowbox trio features a single, perched, plumed bird—fake, of course—and a simple, scripted label which is an opportunity to practice your calligraphy or old-school cursive. Maybe even ask your fourth-grader to pen it out for you. Where am I at with this project? I have three shadowbox candidates. I have sticks and dowels for perches. But I do not have acceptable faux birds. And even though I’m inspired by Blair’s simple, vintage birds, I haven’t found any remotely natural-looking. I got lost in an internet rabbit-hole searching for fabric bird tutorials. And I now have two books on bird-making headed in my direction. While this book has jump-started several ideas and 50% complete projects, I do have one start-to-finish to share: the bead-bombed tote bag. Blair made hers from a woebegone tablecloth. 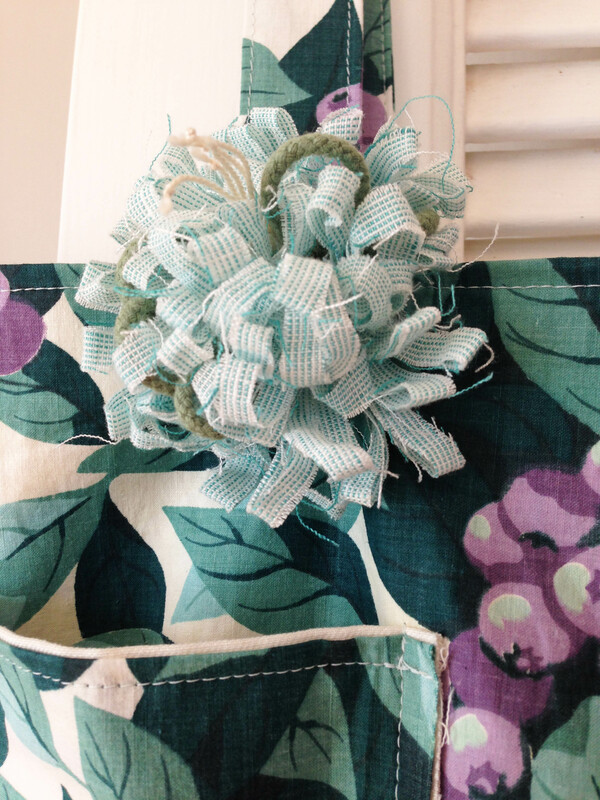 I used a piece of vintage fabric that I’ve been saving for twenty years. Twenty. I am so glad to have put this piece of fabric to use! Further, I live in San Francisco, where reusable bags are a requirement for all shopping (or pay a bag fee, and live with the scrutiny). I have many bags for the grocery shopping, but I like to have separate ones for the library or new sweaters. Enter this tote. I followed Blair’s instructions from start to finish. I think this is a note-worthy comment since I usually see a picture, and try to wing it. But, for the purpose of this review, the instructions are clearly written, and yield a great, sturdy tote. Mine is lined with a medium weight canvas (per instructions) that should support a load from the library, or a long day at the flea market. In the spirit of making it mine, I added a simple pocket, off-centered for right-hand wear, for keys and phone. I started a small patch of beading on the reverse side. It adds a bit of interest to the old fabric. I am not sure how it will wear. I considered sewing the beads in place, but for now, the fabric glue is completely invisible, and the beads are staying put! Like the rest of us artists and makers, winter is a scramble to create holiday gifts, décor, cards, and treats, and if you live in reach of polar vortexes, major efforts to stay cozy. Thus many of Blair’s winter projects are of the felted and fleeced variety. My favorite from this chapter is a remix of the spring flower mirror, simplified into a single bloom brooch. 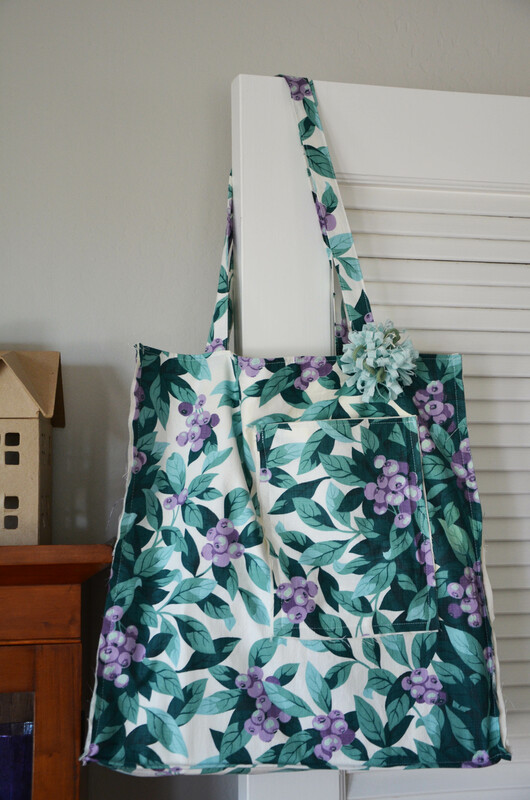 (I added one spring-like flower to the strap/bag intersection of my tote!) This is the perfect, speedy gift for teachers and cousins. It would be a beautiful gift embellishment, or grace a bottle of wine or craft beer. Or make a collection for your caroling group. The thing I love most about this idea is that I’m thinking about it NOW, in May. So I can spend the next few weeks hunting for tartans and plaids when no one else cares. I feel ahead of the holidays already! Thanks, Blair Stocker, for crafting a book that presses into service all those special cast-offs I’ve been saving for just the right project.